…So I have to wear my glasses! You see that bike rider at the end of the street in the first photo? That’s my dad! Haha! Today marks the day my parents found out that I blog. My mom now finally understands why there are a kazillion photos of me on her SD-card. My dad thinks it’s stupid and my littlest sister voluteerd as photographer. As for the outfit I’m almost emberassed to say that everything is from H&M, except for the cameo necklace. My friends gave it to me for my 18th birthday. They bought it for me in Venice, the last stop of our Italian tour. In Belgium, a lot of schools give students a chance to visit Italy, mostely by bus. It was so much fun to take on this 10-day trip with my classmates! I’ll never forget the horrible 22 hour busdrive to Pisa though! Remember this post? I was talking about how madly I wanted to go the the Pukkelpop festival. When I saw the news last night, I couldn’t have been more relieved NOT to have a ticket. A sudden, but really intens storm turned the grounds into hell. A monsoon set everything under water, the wind destroyed the whole campsite, Trees where uprooted, two big tents, where hundreds of people had taken shelter in, have collapsed. I wasn’t there. But an awful lot of my friends were. Most of them are ok, but in shock about what happened. One girl has light injuries, but she’s home. I thank God that all my friends are safe & my hart goes out to the families who lost their loves ones. You kept your blog a secret this long? You should be a secret agent! I showed it to my Boyfriend and Mum and Sister in the first week. 🙂 My Dad still doesn't know about it though but he lives far away. Je bril staat je echt goed! En wauw, kon je het zo lang voor je houden? 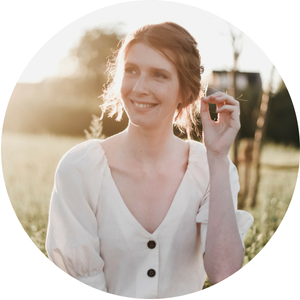 Toen ik 2 jaar geleden begon met bloggen deed ik vooral Beauty en hoefde ik het niet aan iedereen te vertellen, maar nu ik meer over Fashion blog (en je mij dus meer ziet op mijn blog) vertel ik het wel 🙂 Mijn ouders weten het ook al een tijdje alleen snappen ze niet zo goed waarom ik het doe 😛 Je rok is echt leuk! cute skirt hun 😀 you look really pretty! HI! my name's martina and I come from Italy… I'd like you visit my blog and if you want…. follow me! I wait you and your tips! Nice outfit! Love your skirt! You look lovely! Cannot believe about pukkelpop, would never have expected that. I hope everyine there is ok.
Oh wow, I never heard about the whole Pukkelpop festival. That's horrible to hear, but I'm glad your friends are ok. I guess everything happens for a reason, and you not being able to go was a blessing in disguise. 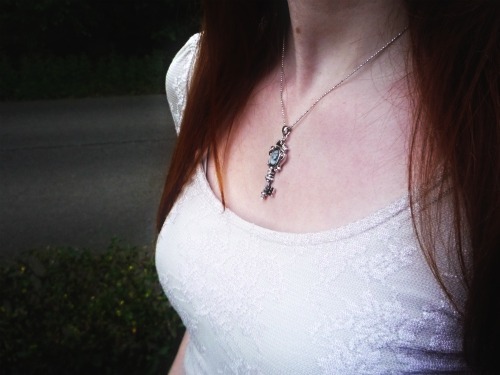 …In other news, I am absolutely smitten with your necklace. My mother-in-law does know I have a blog and she has one too. ^_^ She's always coming to me for help, figuring this or that out. It's awesome. So glad your friends are alright! I love your glasses, you should wear them more often! ps. Glad your friends are alright! Thank God! You look darling in specs! And I super heart that skirt! Yet more proof that dads aren't always right! Horrendous what happened at Pukkelpop isn't it, so sad. You have the BEST hair! I love it! And your smirk is so sweet, haha! I love your skirt. It looks great with your belt, too! Sorry to hear about the monsoon – I'm so glad your friends are ok.
Nice outfit and the glasses suit you well. And about Pukkelpop, I still feel shocked about what happened there, the images look so hallucinatory and scary. My brother was there and I'm so glad he got safely home and his friends as well, we were so worried at home and the network problems didn't make it any easier for everyone. I was normally going today but now I'm just glad that my brother is okay but I do feel terrible for him and the other people who have experienced such a nightmare. My thoughts go out to the victims and my deepest condelences to the families and friends who have lost their loved ones, may they rest in peace. i love h&m! you are so cute! I adore this look! So beautiful! Hehe, my Dad doesn't quite understand my blog either! That's great though that your sister and mother are supportive…Eventually your Dad will come around, too! It seems to be a stroke of fate that you were not there, and I am glad to hear your friends are safe. That's terrible, though. Your family didn't know about your blog?! I can't imagine how I'd hide it from mine. At least there is semi support going on. 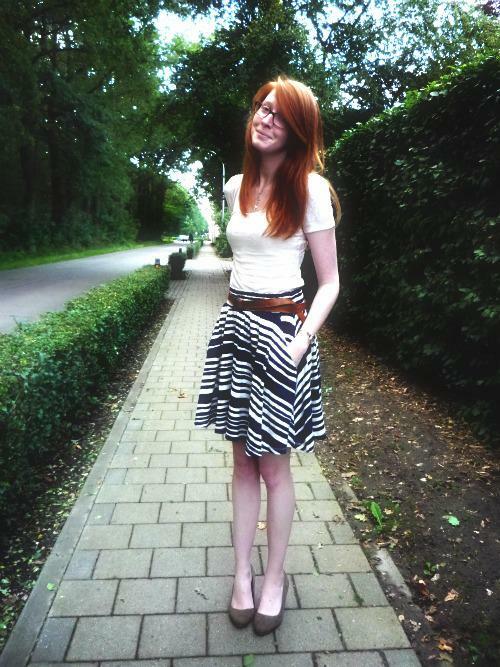 Your outfit is so cute, I love the stripy skirt a lot! They look great on you! I really love your skirt! Sometimes not so good things are for better, good that all of your friends are safe. Nice blog you have there, by the way. Following now. I love your outfit so much – h&m is so great! and pssh your dad is wrong on this one no offense! Nice skirt and pics ! Echt een super leuk rokje ! En haha, mijn ouders weten heb ook al even, ze besteden er gelukkig niet zoveel aandacht aan :p wel super lief dat je zusje meteen vrijwilliger was, altijd wel handig 😉 ! even though you forgot your contacts… the glasses look really great with this outfit! and i love your natural red look. i realllly do. 🙂 theoutfit is great! 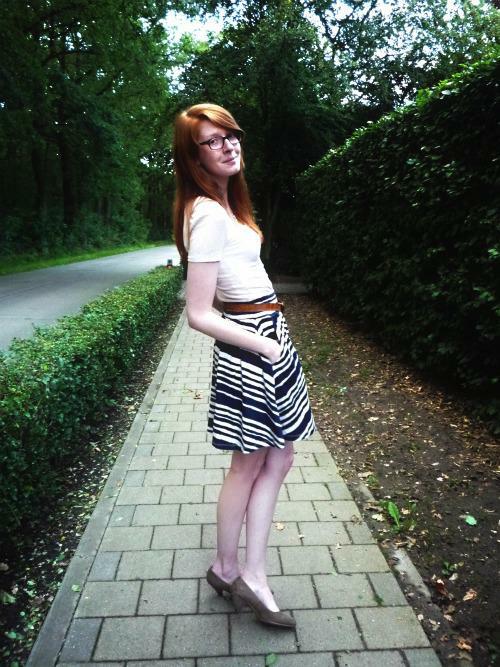 Leuke rok!! en bedankt voor je reactie!! so glad to hear that your friends are okay! the weather gods were not happy ! this is a tragedy! i love your necklace! great gift. I really like the glasses! I need to wear mine sometime in the near future since I got two new pairs. 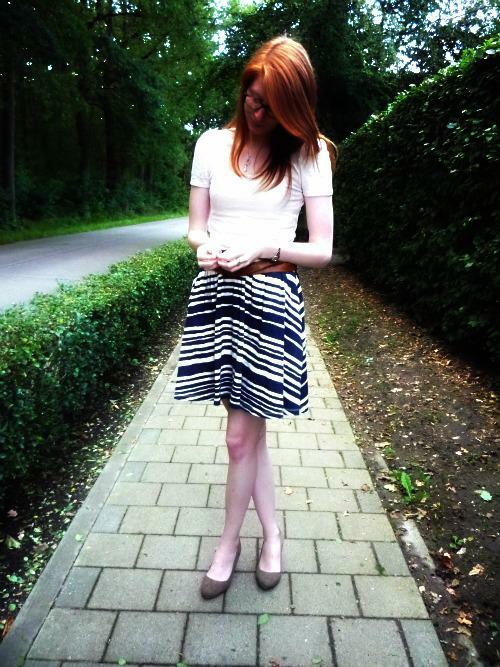 Cute striped skirt!